Today's REALLY? Halloween costume comes to us from a tipster by way of Quincy, MA where some brainiacs decided to slap on some blackface and dress up as George Zimmerman shooting a bloody Trayvon Martin. The pictures are just starting to circulate online, and the girl who posted the photo has already deleted the photo from her Facebook account and her Instagram. The men in the photograph, on the other hand, are still active on social media. Until this morning, the man dressed as George Zimmerman had set it as his profile photo; he changed it and locked his photos sometime overnight. None of the three pictured have made a public comment about the photo yet. 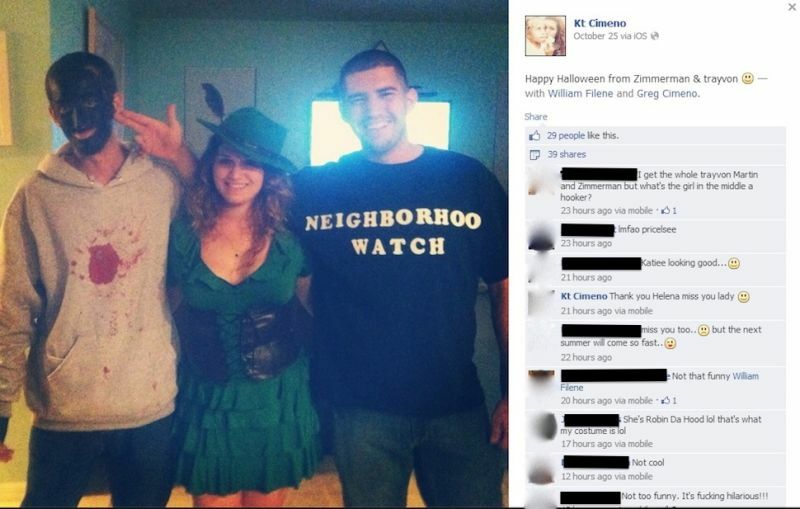 It's not clear if the woman's costume was intended to be part of the joke; but her costume is sold online as "Robyn da Hood". And it's not like they had great taste before Halloween either; according to the man portraying Trayvon, William Filene, his job is "Your Sister," — position, "69 ;]".